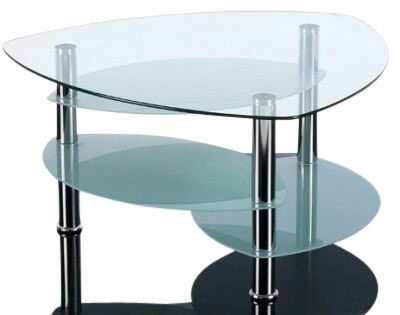 Stunning glass coffee tables with a four tier design and Chrome columns. Available from stock and delivered in 3-5 days. Original design with an overall contemporary and elegant look. Designer coffee table in glass, consisting of four petal shaped pieces of toughed glass and three chrome columns. This range is held in stock for a delivery lead time of three to five working days.